Every September during the Autumn Moon Festival, the lines form round the block for Golden Gate’s famous moon cakes, filled with things like pineapple, coconut, lotus seed, red-bean paste and sugared melon. 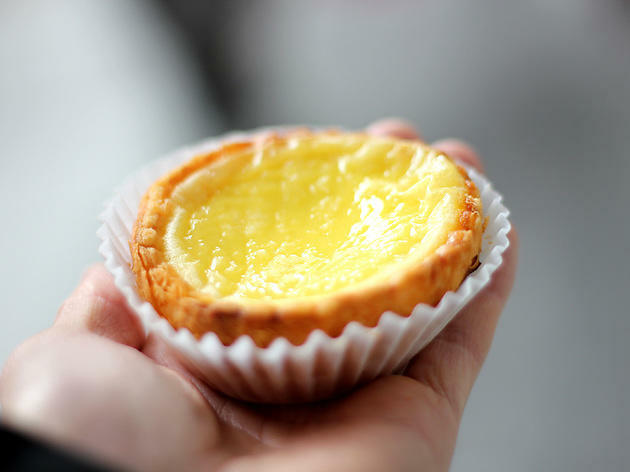 A 40-year-old Chinatown institution, the bakery is also the place for other Chinese baked specialties, including egg custard tarts, coconut macaroons, sweet rice cakes and vanilla cream buns. Sometimes I find myself questioning what's worth the wait. 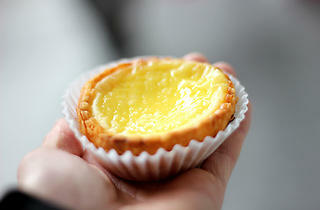 Well, let me tell you that these egg tarts are definitely one of those things. This bakery is quite elusive. Google will give you a certain opening time, Yelp will tell you another but ultimately it's the sign on their door that will dictate if you will leave happily with egg tarts in hand. I found out the hard way about the time as I arrived at 10am ready to receive these deliciously egg-y, palm-sized treats but read the hand-written sign that said "noon". I wandered around for a bit but returned by 11:30am. I was already 10th in line at this time and patiently waited for noontime. Slowly but surely the line moved and I approached the counter where three older women were bustling around selling "cash only" Chinese pastries, but most of them were egg tarts being bought by the dozen. Totally worth the wait. I've never had anything like them and I crave them constantly. Fair warning.